Characteristic: Denish motor, appliances and secret auxiliary table with aluminium foot support! 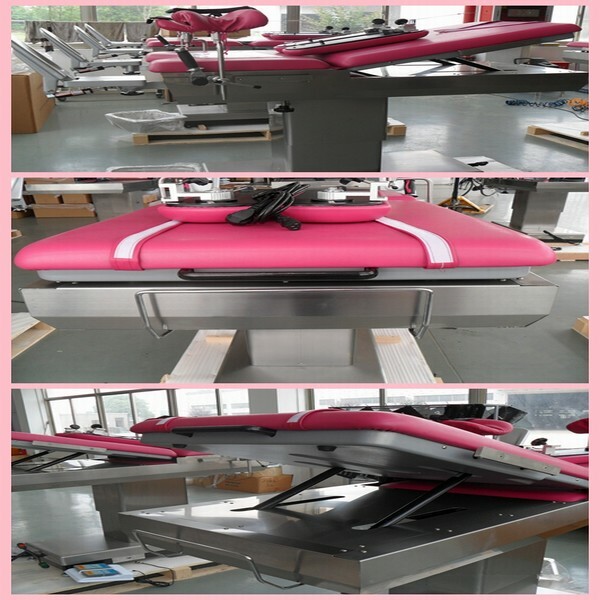 The obstetric table is designed and manufactured to meet the need of the market. It absorbs the advanced foreign technology. It is used for childbirth, gynecology surgical operation, examining and many other functions, including urgent caesarean operation. The ascent and descent, forward and backward tilting of this set are manipulated by micro touching controller, of usage convenience and agility. The key part of power system adopts imported electric motor, low in noise and stable in nature. The back section adopts gas springs structure, and the angle can be regulated. The auxiliary table is controlled by hand, can be concealed, making the operation convenient. Foot controls the fix and move of the base set. The planks, basins and all outer shells are made of stainless steel, which makes nice appearance and easy cleaning. Available in a choice of colors of foot and soft mat.